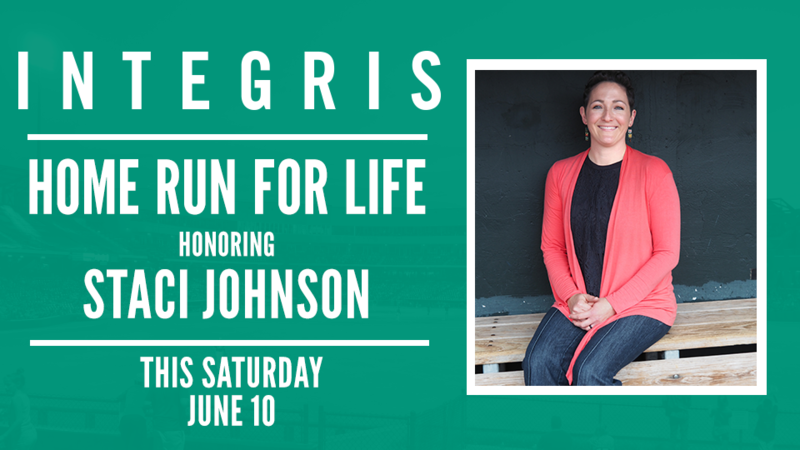 OKLAHOMA CITY - The Oklahoma City Dodgers and INTEGRIS continue the 2017 "Home Run for Life" series Saturday at Chickasaw Bricktown Ballpark by recognizing Staci Johnson, who was diagnosed with breast cancer last year at the age of 36. Johnson was proactive in her treatment after discovering an unusual lump in early 2016, and embraced positivity throughout her treatment at INTEGRIS Cancer Institute and INTEGRIS Comprehensive Breast Center. The Bethany resident is now in remission, back to work and enjoying her time with her husband Mike and sons Hunter, 9, and Wyatt, 5, with a fresh perspective. In January 2016, Johnson noticed an unusual lump after exiting the shower. She made an appointment with her physician, but didn't give it much thought otherwise as she had no history of breast cancer in her family. An ultrasound, mammogram and biopsy followed in the coming weeks at the INTEGRIS Comprehensive Breast Center, and in February 2016, Johnson was diagnosed with invasive ductal carcinoma. She allowed herself to be distraught for the next two days, but then decided that to beat this, she needed to keep a positive mimndset throughout the coming months. "For the most part I didn't let it get me down. I was very positive," she said. "I had that initial couple of days, but then I just thought: 'Nope we're going to get this taken care of.'" She started her first chemotherapy treatment March 10, 2016 at the INTEGRIS Cancer Institute and had eight rounds of chemotherapy total that lasted into July. "They didn't waste any time which is a blessing because they just took over," Johnson said. "Your brain is muddled. There is so much information being fed to you that you just kind of follow the path and I knew I was in good hands." Her first four rounds of chemotherapy were strong and came every two weeks. She started to lose her hair before her second treatment and asked her husband to help shave her head. The last four rounds of chemo came every three weeks. Exhaustion, aches and pains followed each round. She would go in for chemo on Thursdays and return to work on Tuesdays. Some days were more difficult than others. She had surgery in September and then radiation treatments in November and December. She received the encouraging news that she was in remission in the fall of 2016. Throughout her treatments, appointments and recovery, positivity and support enveloped her. Johnson said the staff at INTEGRIS Cancer Institute became part of her family because of the encouragement and outstanding care they offered. Her friends and family offered other forms of support, bringing food to her family, helping with shopping and assisting in keeping her sons' lives as normal as possible through it all. "It's just so amazing that when you need it, there is so much compassion," Johnson said. Her illness initially forced her to slow down. But slowing down also brought her a new perspective and is a practice she continues today. "Just being willing to say no and making certain things the priority and cherishing the moments you do have," Johnson said. "That was my big thing. Those things you do pick to do with your friends and family, just cherishing them because life is so short." To read Johnson's full story, visit okcdodgers.com. Watch Staci Johnson complete her "Home Run for Life" following the third inning of Saturday's 7:05 p.m. game against the Round Rock Express at Chickasaw Bricktown Ballpark. The Dodgers open a seven-game homestand at 7:05 p.m. Friday and fireworks are scheduled to follow the game. The series continues at 7:05 p.m. Saturday. Sunday's 6:05 p.m. game falls on a Chaparral Energy Family Sunday filled with family-oriented activities, including pregame player autographs and kids can run the bases after the game. The homestand continues with a four-game series against the Omaha Storm Chasers starting at 7:05 p.m. Tuesday, June 13. A Field Trip Day game follows at 11:05 a.m. Wednesday, June 14. Thursday, June 15's 7:05 p.m. game against Omaha falls on a $2 Thursday, featuring $2 soda, water and beer from a line of Pepsi and Budweiser products. Fireworks are scheduled to follow the homestand finale that starts at 7:05 p.m. Friday, June 16 against Omaha. For tickets or additional information, please call (405) 218-1000, go online to okcdodgers.com or visit the Chickasaw Bricktown Ballpark ticket office located on South Mickey Mantle Drive.